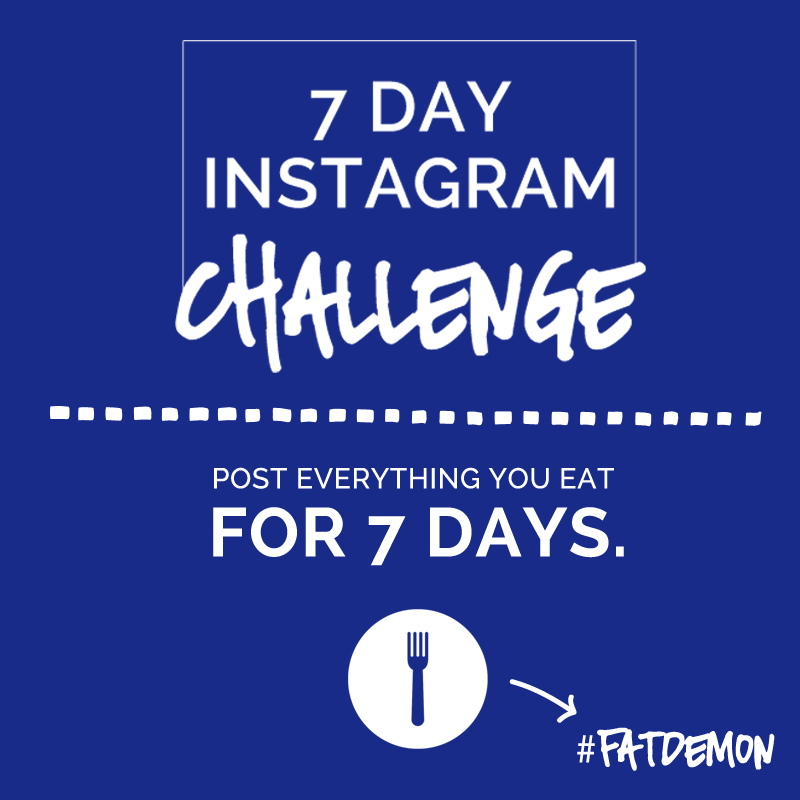 7 Day Instagram #FATDEMON Challenge! Thanks for your interest in participating in the #FATDEMON Challenge! 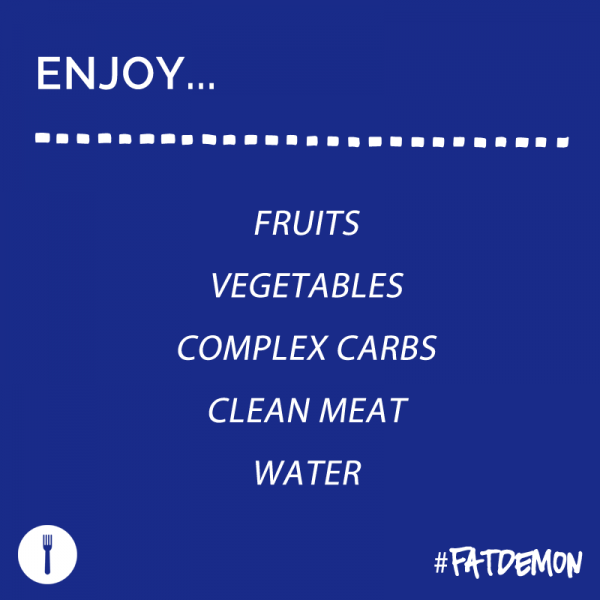 CLICK HERE for the FREE”#FATDEMON Tips” Printable! 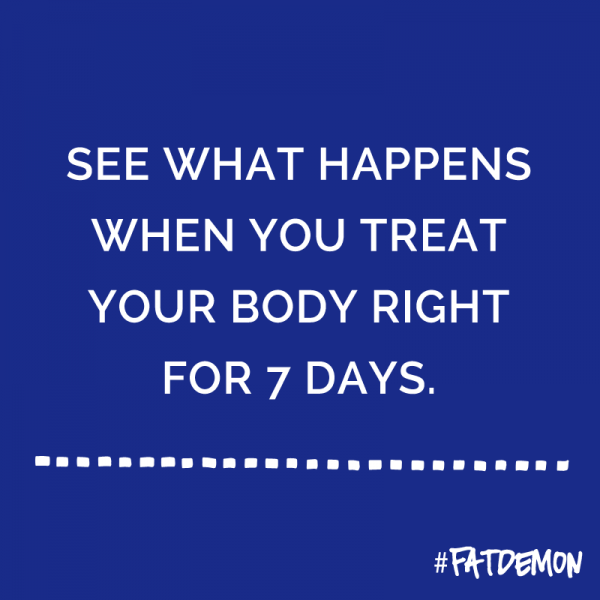 So what exactly is the #FATDEMON 7 day challenge? The #FATDEMON Instagram Challenge is coming back!!! Back in January of this year, I resolved to record everything I ate and to take a few pictures here and then as a way of staying accountable to others for what I put in my mouth. I lost 9 pounds in 7 days. Then… back in August of this year, I decided to snap pics of my food again, and this time, I invited others to participate with me. We all snapped pics of every meal for 7 days. It helped. I lost more weight. I’ve been asked non-stop since the last challenge to repeat it. Partly because I was asked to. Partly because I fell off the wagon and want a running start to jumping back on before the holidays leave me in the dust. Grab a partner because accountability matters. The point is that if you know other people are looking, you will think twice about what you put in your mouth. The point is conscious, intentional eating. The point is accountability being important in the battle for self-control. Snap pics of EVERYTHING YOU EAT. 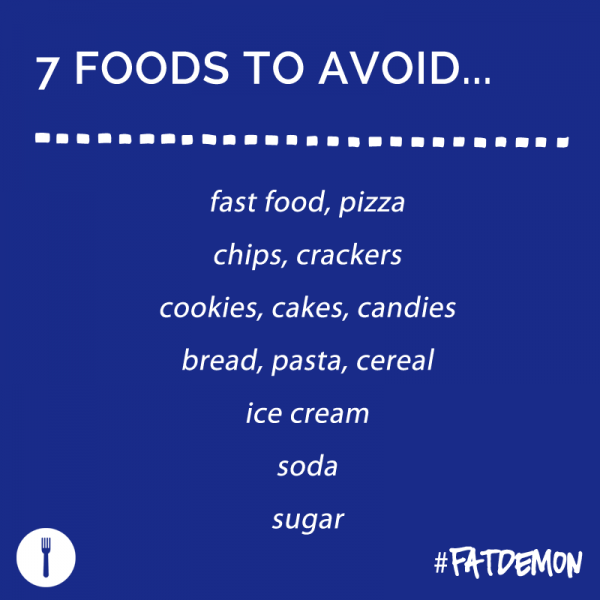 Here are BASIC foods to steer clear of. I know that some of you will want to do even more than this. That’s great! DO YOU! The goal is to avoid foods that are highly processed, full of fat, full of unwanted calories, and full of things that will keep your body from operating at its best. At the very least, commit to avoiding the drive-through lane as much as possible. Avoid foods high in sugar. Avoid carbs made with white flour. Avoid soda. Even diet soda. What can you eat? I’m glad you asked! This is not the time to throw everything that is currently in your pantry or your refrigerator in the trash. 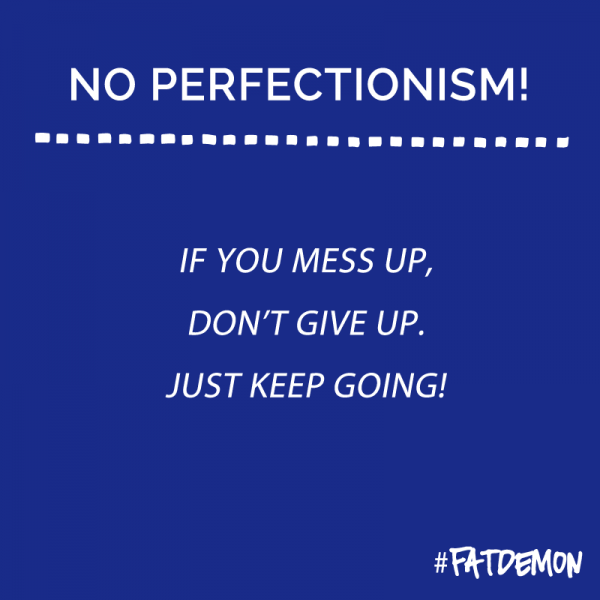 Perfectionism for many of us will lead to failure. Start where you are. Use what you have. When you go to the grocery store simply make a few more choices that are better then you would have made last week. Don’t stress about trying to completely change your life in one week. Just put 1 foot in front of the other. And do a little better than you did before. You are not trying to be better then your friend, your sister, or be just like the fitness guru on Instagram. You are trying to be better then the person you were yesterday. You are trying to make better choices than the choices you made yesterday. What should your choices look like? You decide. I will give you some guidelines… But you know your life. The idea is simply to make conscious and intentional decisions with what we put in our mouths. If you mess up, just do better at the next meal. Don’t make a bad choice on Tuesday for lunch and then scrap the rest of the week! Just pick up at Tuesday dinner and move forward. Want even more of a challenge? Try this! If you want more out of your experience, try the RULE OF 7! 7 food categories of foods that you WILL NOT EAT! 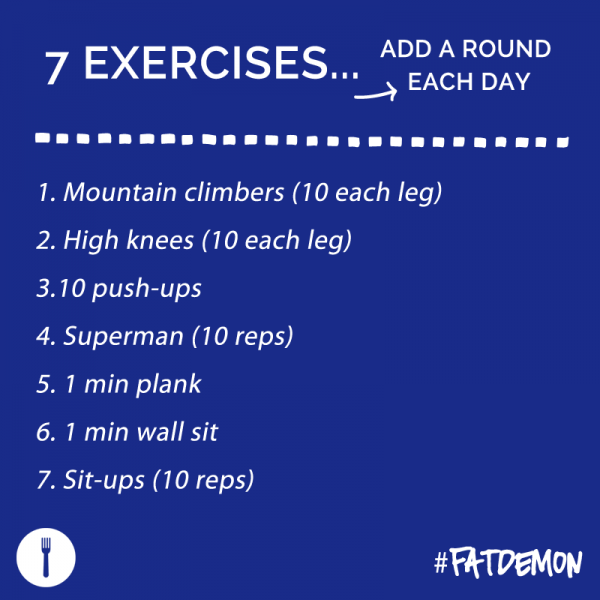 7 rounds of exercises that you will do… increasing rounds as you go! Here are the 7 food categories! If you couldn’t make it at home, don’t eat it. If it takes the place of a better choice you could make with a little extra effort, don’t touch it! Here are the 7 exercises! Watch the video below for the exercises! 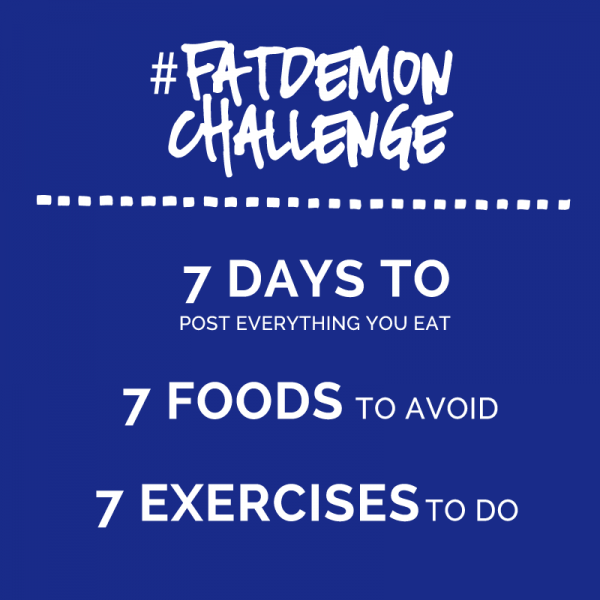 Hope I’ve convinced you to join me on the #FATDEMON challenge. 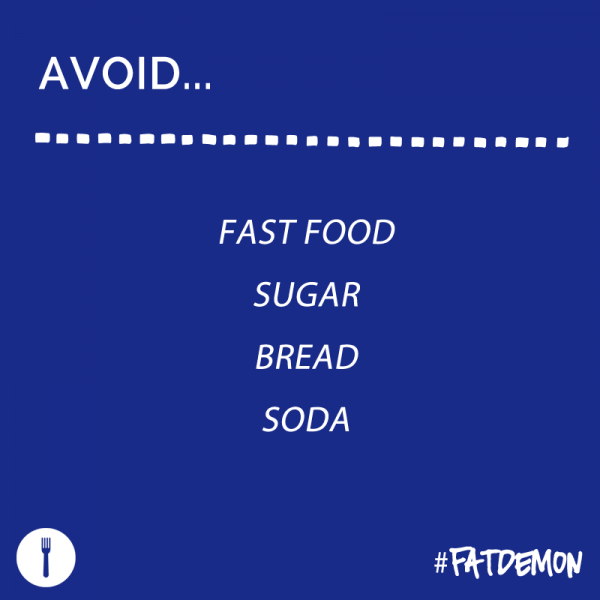 Want to read more about my battle with the #FATDEMON?